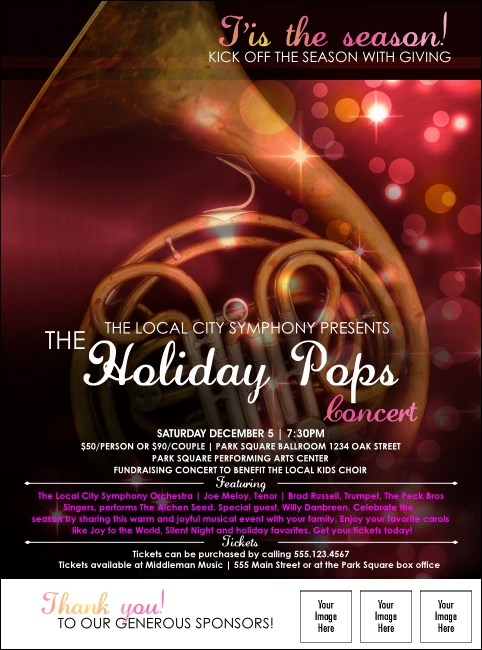 Long before you cue the maestro, cue great pre-event advertising for your Christmas concerto with Symphony Holiday Pops Logo Flyers. This template includes room to upload three unique images, so you can add sponsor logos or even a picture of the maestro himself to go with the shiny gold French horn and glittering pink and orange lights. Bring harmony to your holiday event with TicketPrinting.com.